Whisky makers are plundering the history books, resurrecting old names and bringing them back into the spotlight. Richard Woodard examines two projects with contrasting philosophies. Whisky has a rich and diverse history, but a number of the household names of yesteryear have failed to survive into the 21st century, fading from memory and preserved only in the annals and ledgers of the past. As whisky makers search for authentic stories that resonate in the millennial age, they are raiding the history books and rediscovering some of these forgotten brands, returning them to the spotlight with new bottlings and releases. Two contrasting projects illustrate this phenomenon: one a personal, family initiative to try to recreate a blended whisky of the past; the other a more freestyle resurrection of one of the pioneers of modern Scotch, comprising a number of new releases – and the construction of a distillery in the historic whisky location of Leith. Around the time that he was preparing to launch online trading platform Whisky Invest Direct, Rupert Patrick began to think about another project: the revival of James Eadie, the eponymous blended Scotch created by his great-great-grandfather. The story, as much as the whisky, intrigued him. Eadie had left school at 14, then moved south to Burton upon Trent to set up a brewery in 1854, aged only 24, while also continuing the family tradition of blending whisky. In 1877, he took advantage of new legislation to register a simple logo – James Eadie’s Trade Mark ‘X’ – and the whisky sold under that name ended up behind the bars of more than 300 James Eadie pubs. The James Eadie business was eventually sold to brewer Bass, which ceased production of the whisky in 1947. Eadie also attracted the attention of Victorian whisky and beer writer Alfred Barnard, who visited the James Eadie brewery and sampled the blend, describing it as ‘an ancient Scotch mixture that was dispensed to a favoured few’ in his book, Noted Breweries of Great Britain and Ireland (Vol II). That, along with scattered family memorabilia and the fact that ‘quite a few cases’ of the whisky were still kept by Eadie’s descendants, was enough to persuade Patrick to visit Burton’s National Brewery Archive. The ledgers gave the recipe for the James Eadie blend; assembling the component parts, however, took more than a year. ‘There’s probably four or five that we just couldn’t get hold of because they closed in the 1920s and 1930s, like Kirkliston and Provanmill,’ explains Patrick. ‘The other 14 were pretty doable, including Cambus and Littlemill [which closed in 1993 and 1992 respectively]. I thought we might be able to get that stock and it would be nice to have two grains, rather than one. The task was made easier by Patrick’s industry connections: he’d worked at Ian Macleod Distillers for several years, as well as at Beam and Diageo. ‘At least I knew as a salesman which door to knock on,’ he says. Together with these regional proportions – so much Campbeltown, so much Highland and so on – Eadie’s recipe called for a ratio of 56% grain and 44% malt, and Patrick reckons that his blender – the highly experienced Norman Mathison – has kept ‘pretty much’ to Eadie’s age stipulations. The ‘new’ James Eadie, priced at about £45 a bottle – ‘I wanted this to be a whisky that people drink and not collect,’ says Patrick – has secured listings with Royal Mile Whiskies, Master of Malt and UK supermarket Waitrose, along with international distribution. But how sustainable is it? There could be spin-offs too – the Eadie ledgers refer to bespoke whiskies blended for a couple of pubs, which could spawn limited editions, as well as the recipe for the last batch of Special Old Scotch Whisky, which might be bottled using a replica of the original packaging. Former Whyte & Mackay sales director David Brown had thought that the Glasgow Distillery would be his last big whisky project – but then Halewood Wines & Spirits, owner of the John Crabbie brand, came calling. ‘They said: “Look, we love what you’re doing in Glasgow; how do you fancy coming and doing that with us in Edinburgh?”’ The fact that Edinburgh is Brown’s home town, and that he lives two miles from Leith, helped swing it. Then Brown began to read up on Crabbie and, if he hadn’t been sold on the project before, he was now. The name may have become more associated with green ginger wine than whisky, but John Crabbie was the first chairman of the North British grain distillery, a plant he helped establish with Andrew Usher to break the near-monopoly of Distillers Company Ltd (DCL). The initial John Crabbie releases, using sourced whiskies while plans for a new distillery are finalised, reflect this thinking. Yes, there’s an eight-year-old in homage to Crabbie’s famous eight-year-old blend, but it’s a single malt. ‘He wouldn’t have done that as a blend today, he would have done it as a malt,’ says Brown firmly. Meanwhile, a companion 30-year-old malt – a lightly peated Speysider that resulted from a ‘mistake’ made at its unnamed distillery – is selling fast, with Brown already planning a replacement of a similar age profile. The distillery will probably echo the versatile approach used at Glasgow, making a mix of unpeated, peated and triple-distilled spirit, although Brown is at pains to point out that ‘others will probably be pushing the boundaries more than us’. A range of cask finishes will also feature. Until the distillery is up and running, the aim is to ‘fill in the gaps’ in the nascent Crabbie range of sourced single malts – maybe with an NAS, a 12- or 15-year-old and an 18-year-old. ‘You can’t have a portfolio with an eight and a 30,’ says Brown. ‘It’s a bit like only having a putter and a driver in your bag. ‘Actually it’s quite liberating because what it allows you to do is to shop around,’ he adds. ‘Essentially you’ve got access to everybody’s whisky stock, although not everybody is going to sell it to you – just like John Crabbie, when he went to the islands and bought Jura and Laphroaig. The 19th-century brand has been resurrected ahead of plans for a new Edinburgh distillery. The new plant will continue the revival of the John Crabbie name in Scotch whisky. 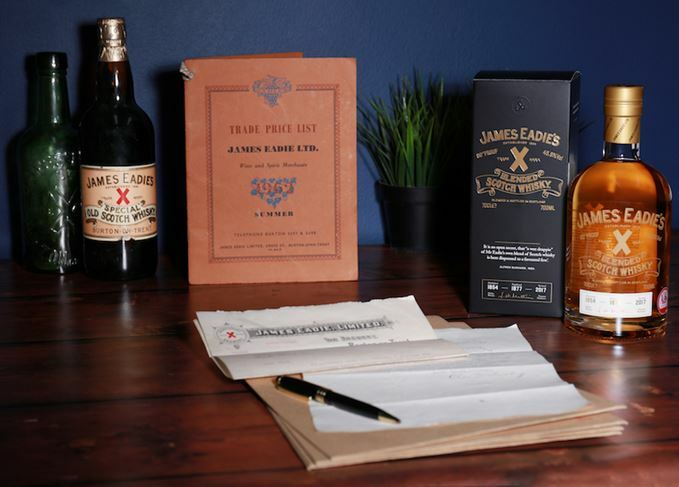 James Eadie’s Trade Mark X blend has been recreated 160 years after its conception. Halewood International intends to bring Crabbie’s back home with a new distillery in Granton.